Bro-hop. That’s what I’m calling this strange genre that’s been taking over my peers’ iPods and Facebook statuses as of late. I’ve listened to a few songs that they’ve directed me to, made by groups like The Dean’s List, Chiddy Bang, and Sam Adams. I understand the appeal, and have just come to accept that this music is not for me. It’s all catchy as hell, but low on substance and meaning, focusing more on the egos of the people who make it than on anything else. Then one day, a Facebook friend posted a song by someone named Hoodie Allen. It was one of the worst things I’ve ever heard. Remember that Asher Roth guy from a few years back? It was like him, with less production, and a cheesy-as-balls motivational message behind it. I thought it was a joke, but after further investigation, I discovered that people—my friends, no less—actually like Hoodie Allen. Naturally, I had to give his full album a listen. It hurt. It hurt so much. I’ve got nothing good to say about Pep Rally. How I got through the entire record, I will never know. If you’re looking for corndog beats and some of the worst rapping in history, look no further than Hoodie Allen’s first—and god-willing his last—record. It’s like he’s trying to be Bo Burnham for bros, except his numerous attempts at puns are not at all funny. 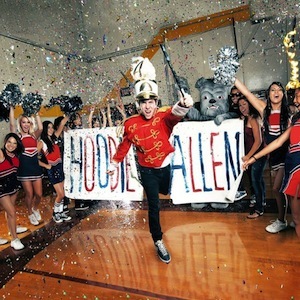 All of his raps focus on one person—Hoodie—which is really obnoxious because he’s not the least bit interesting. “Lately I’ve been staying on my grind like a skateboard/I’ve got some Rocket Power now so let’s take off/We going hard over these beats, y’all just stay soft.” Genius. He thinks sampling indie bands like The Black Keys, Beach House, and Two Door Cinema Club is going to bring people like me in as fans. Not a chance. When I heard the Cold War Kids sample start up on Joy & Misery, I almost started to cry. Don’t worry, though, you’ll have plenty to fist-pump about with your bros as you crush another brewski when he’s playing Perry’s stage at Lollapalooza next year. Yeah, you look really cool in that snapback and lax jersey, brah. I guess I hate what this music stands for more than anything.